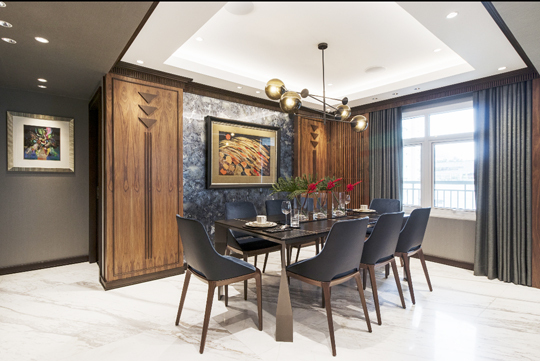 Dr. Jigs Adefuin of Adefuin Design Studio, recently gave a glimpse into his client’s psyche when he designed her 170-square meter condominium unit at Meranti Two Serendra, Bonifacio Globe City. The expansive unit exhibits an art deco style inspired from the pieces of jewelry the lady of the house wears. It is consistent with Jigs’ belief that a home is not just where you sleep and live; it is who you are. 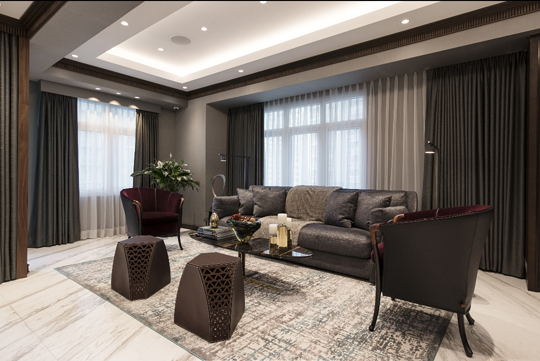 Gray, brown, and beige hues dominate the interior, with small doses of black, adding some drama. For the flooring, the natural beauty of walnut wood enhances the elegance of the interiors, and matches the silk wallpaper. Marbled surfaces create a sense of light, emphasized by mirrors and decor with metallic details. Artwork from the couple’s collection, among them paintings from Joya, Alcuaz, and Nuyda, are displayed around the interiors. An Italian leather sofa serves as the focal point of the living room, with accent chairs that blend with the overall look of the space. Coupled with other furniture pieces that are proportional to the size of the room, the space doesn’t look too crowded. A mid-century chandelier greets visitors to the dining area. The piece warms up the whole space, from the chic dining table and chairs, to the accent pieces. A narrow hallway leads to the master bedroom. 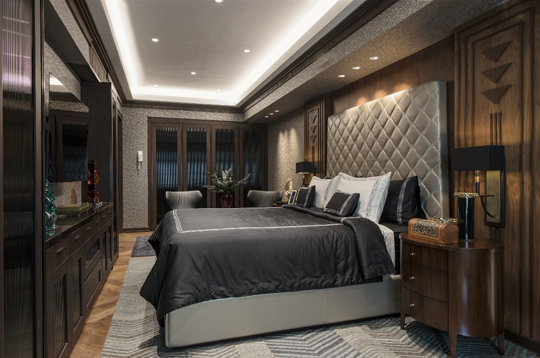 The bed, with its padded leather headboard, is at the center, with a small office to one side and a bathroom and walk-in closet on the other. Art deco elements abound —a night stand with sunburst and vintage handles, cabinet doors with fluted glass painted black, textured wallpaper from London, and wooden floors with chevron patterns. The master bedroom is just one of three bedrooms in the unit. The couple actually bought two units in the residential building (a one-bedroom and three-bedroom unit), which Jigs had to reorganize to create a layout that would suit their lifestyle. The two remaining bedrooms are for the couple’s two children. Each one is laid out according to the specifications of its user, like how the girl’s room was designed with more storage space for her bags and clothes. Jigs maximized the space by transforming the space under the bunk-style bed into additional storage. “As their designer, I made sure that every area is functional. Every space would serve a purpose,” he said. All rooms feature the same wood veneer with solid trimming and fluted glass, but each room reflects the personality of each family member. The boy’s room has blue and light bronze wallpape, which the son personally picked. The girl’s room has a blue and gold wall paper with geometric patterns.